CAC-approved coins outperformed other certified coins in the Heritage and Stack’s-Bowers auctions at the ANA Convention in Philadelphia. 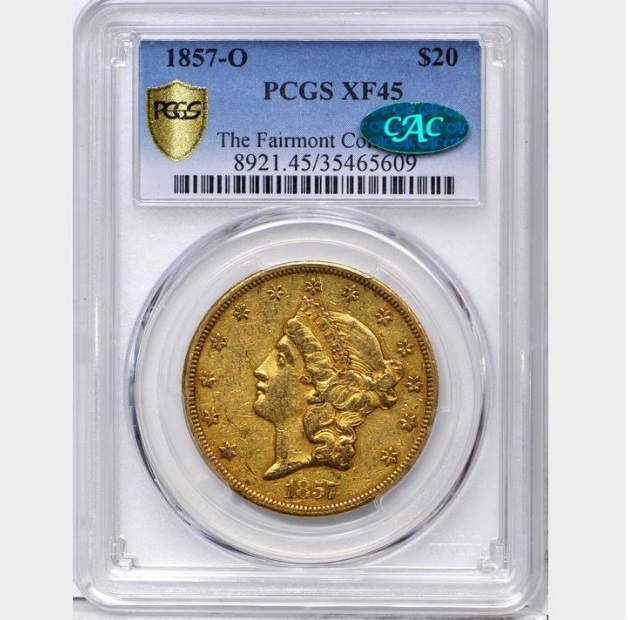 Also, CAC coins continued to bring substantial premiums in Internet sales by GreatCollections. Here are 10 examples, which were selected from a large number of results that could have been listed. 1857 Flying Eagle cent MS-64 CAC. Hover to zoom. Photo credit: GreatCollections. 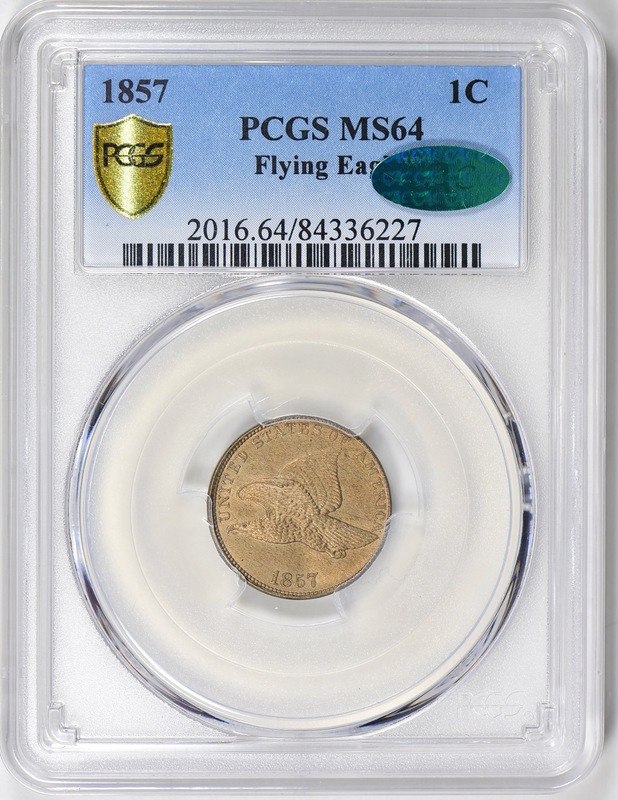 On August 12, GreatCollections sold a CAC-approved MS-64 grade 1857 Flying Eagle cent for $1,649. This same firm sold certified MS-64 1856 Flying Eagle cents, without CAC stickers, for $1,056 on March 25, 2018, for $1,132 on November 5, 2017, and for $1,031 on August 6, 2017. 1937-D Buffalo nickel MS-67 CAC. Photo credit: GreatCollections. 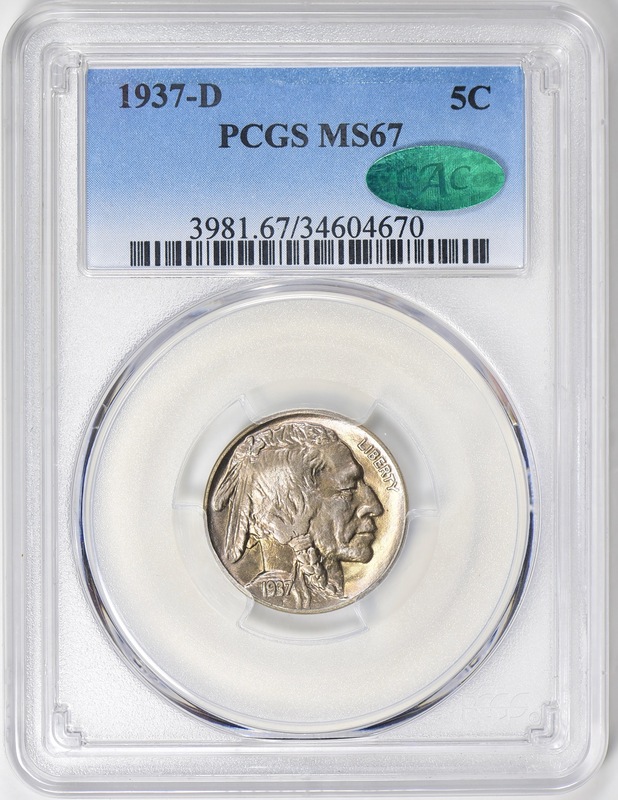 On August 12, GreatCollections sold a CAC-approved MS-67 1937-D Buffalo nickel for $703. Recently, this same firm sold non-CAC, certified MS-67 1937-D Buffalo nickels that were bid up to levels much lower than $703: $420 on July 22, $405 on July 1, $356 on June 10, and $405 on May 27, 2018. 1927-D quarter MS-66 Full Head. CAC. 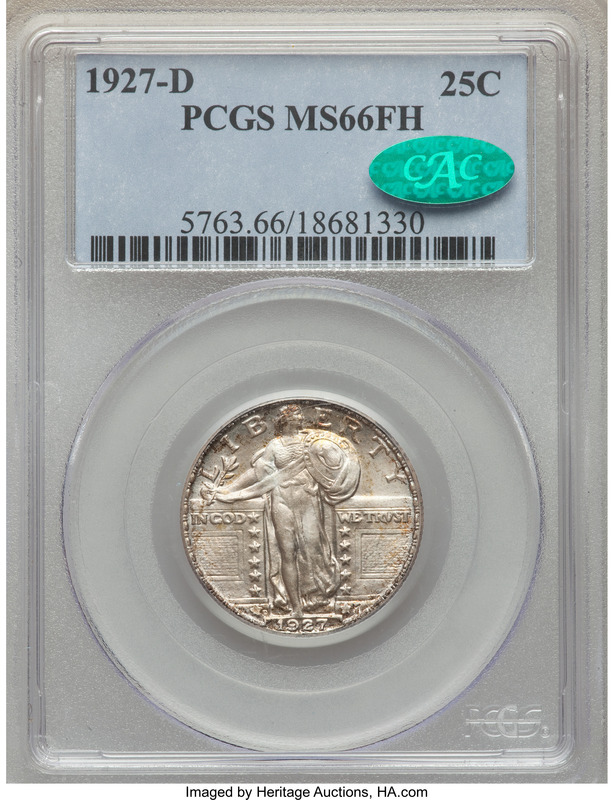 On August 14, Heritage auctioned a CAC-approved MS-66 grade 1927-D quarter with a Full Head designation for $13,200. In January 2017, this same firm auctioned another CAC approved MS-66 Full Head 1927-D quarter, which realized $9,693.75. 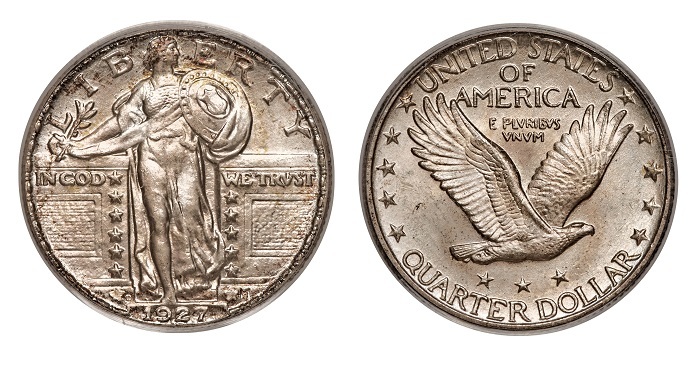 In contrast, in June 2018, Heritage auctioned a certified Full Head 1927-D quarter, without a CAC sticker, for $4,320, much less than half as much as the prices realized for either of the cited CAC-approved coins. Also in August 2018, another auction firm sold a non-CAC, certified MS-66 Full Head 1927-D quarter for $3,840. 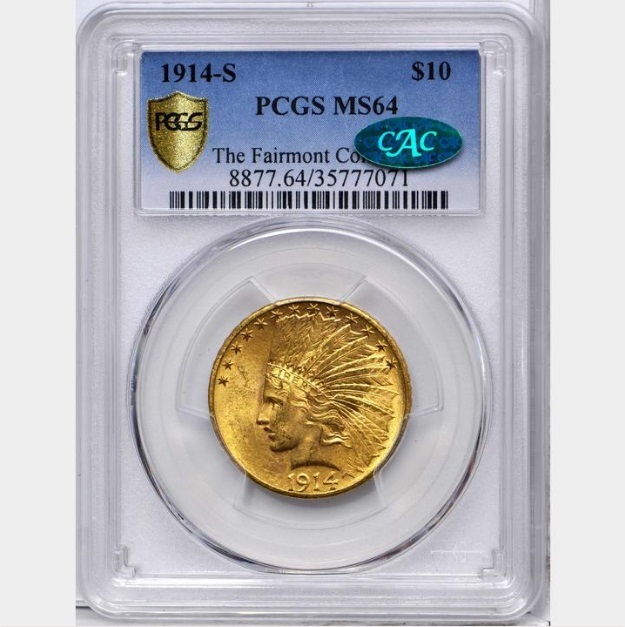 On August 14, Heritage auctioned a CAC-approved MS-66 grade 1915-S $20 gold coin for $9,900. Earlier this year, the same firm sold two certified MS-66 grade 1915-S $20 gold coins, each without a CAC sticker, for $5,040 in June and $4,560 in January, respectively. 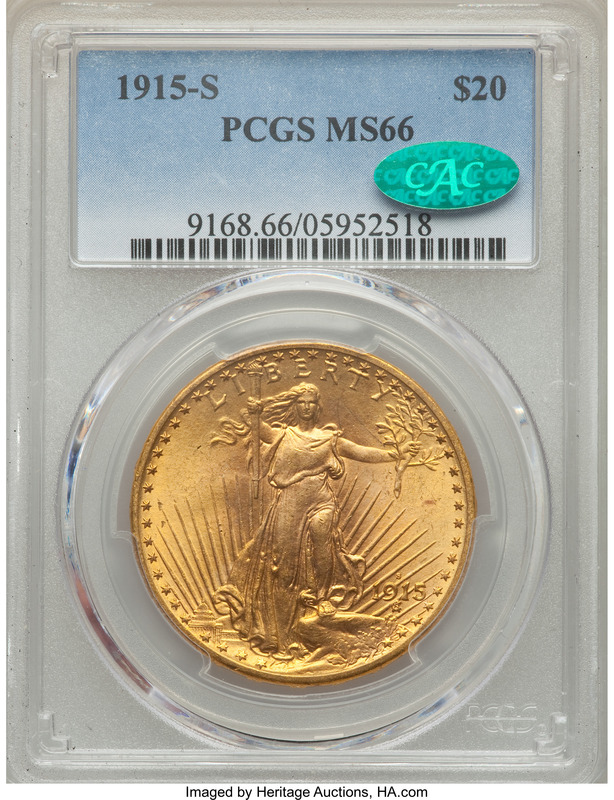 A different auction firm sold a non-CAC, certified MS-66 grade 1915-S $20 gold coin for $3,720 in November 2017. 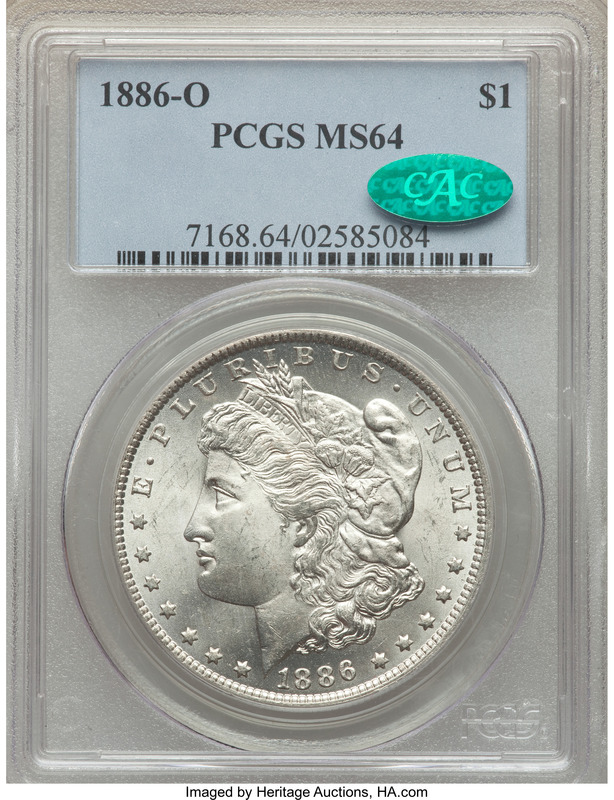 On August 15, Stack’s Bowers auctioned a CAC-approved, MS-64 1886-O silver dollar for $10,800. Two days later, this same firm sold a non-CAC MS-64 1886-O silver dollar, which was certified by the same grading service, for $6,600. The results for this duo parallel the sale of two other 1886-O silver dollars that were graded MS-64 by the same grading service in the Heritage auction at the Summer FUN Convention in July 2018. A CAC-approved MS-64 1886-O then sold for $10,200 and a non-CAC MS-64 1886-O then brought $6,021.60. 1857-O Liberty Head Double Eagle. EF-45. CAC. Photo credit: Stack’s Bowers Galleries. On August 15, at the ANA Convention in Philadelphia, Stack’s Bowers auctioned two 1857-O $20 gold coins, in consecutive lots. The first was graded AU-50 by the leading service and it sold for $13,200. The second brought $15,600, was graded EF-45 by the same grading service, and had a green sticker of approval from CAC. So, the certified EF-45 coin, with a CAC sticker, brought more than the certified AU-50 1857-O, which was graded by the same service yet did not have a CAC sticker, $15,600 versus $13,200. 1917 Standing Liberty quarter. Type I. MS-67 FH. CAC. Photo credit: Stack’s Bowers Galleries. 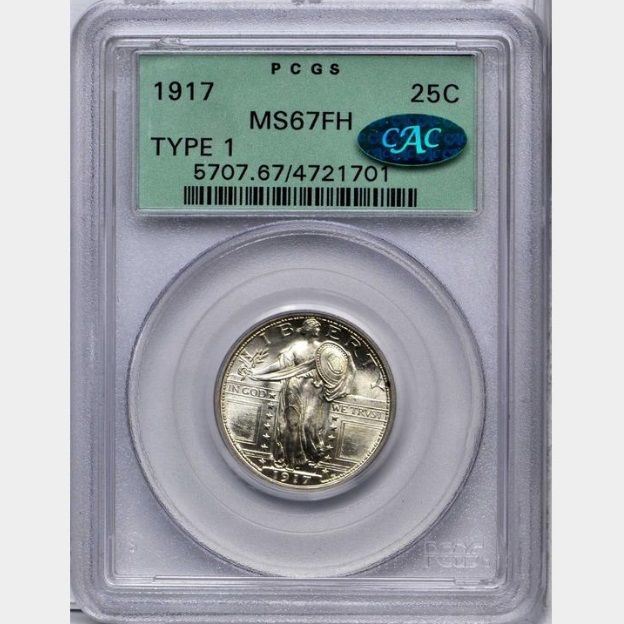 On August 17, at the ANA Convention in Philadelphia, Stack’s Bowers auctioned a CAC-approved, 1917 (Type One) MS-67 Full Head Standing Liberty quarter, for $5,760. All the 1917 quarters mentioned here are of the first type and are certified as MS-67 with a Full Head designation by the same grading service. Three days earlier at the same convention, on August 14, Heritage auctioned one such quarter without a CAC sticker for $2,040. In April 2018, DLRC sold one with the same certification, also without a CAC sticker, for $2,540. In January 2018, Heritage auctioned another CAC-approved 1917 quarter for $13,200! In August 2016, Heritage sold another without a CAC sticker for $2,585. 1914-S Indian Eagle. MS-64. CAC. Photo credit: Stack’s Bowers Galleries. On August 17, at the ANA Convention in Philadelphia, Stack’s Bowers auctioned a CAC-approved MS-64 grade 1914-S $10 gold coin for $19,800. On April 29, Heritage auctioned a 1914-S $10 gold that was graded MS-64 by the same service though was not approved at CAC. This non-CAC coin brought $5,520 in 2018, though a year earlier, that exact same 1914-S $10 coin was sold by Heritage for $7,050. 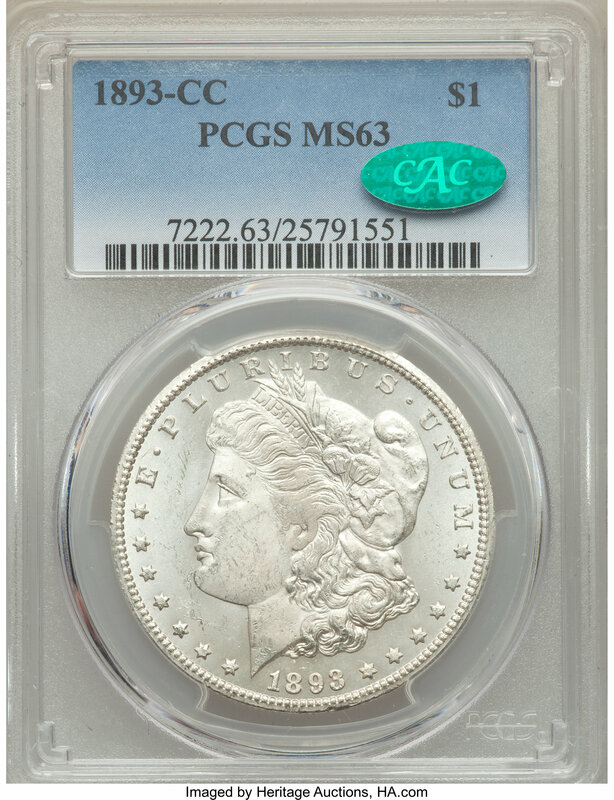 On August 17, at the ANA Convention in Philadelphia, Stack’s Bowers auctioned a CAC-approved MS-63 1893-CC silver dollar for $7,800. The day before, at the same convention, Heritage auctioned six 1893-CC dollars that were certified as grading MS-63. Only one of the six had a CAC sticker and it brought $7,200. Of the five non-CAC, certified MS-63 1893-CC dollars that Heritage auctioned on August 16, three realized the exact same price: $5,520. The other two brought $5,640 and $6,600, respectively. On July 18, DLRC sold a CAC-approved MS-63 1893-CC for $8,000. On July 12, Heritage auctioned a certified MS-63 1893-CC, without a CAC sticker, for $6,000. It seems clear that the CAC MS-63 1893-CC Morgans have been bringing prices that are significantly higher than those realized by non-CAC MS-63 1893-CC Morgans. 1923-D Saint-Gaudens Gold Double Eagle MS-65 CAC. Photo credit: GreatCollections. 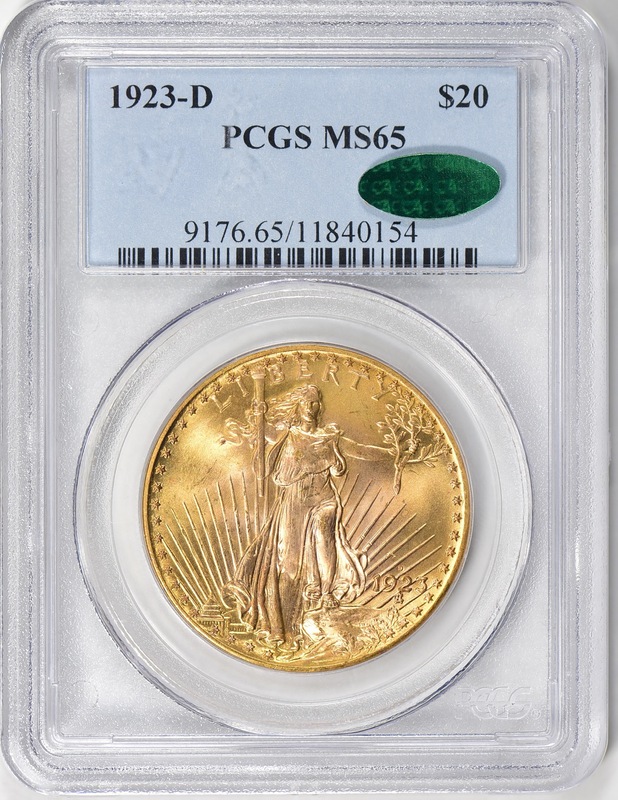 On August 19, GreatCollections sold a CAC-approved, MS-65 1923-D $20 gold coin for $2,700. Earlier, GreatCollections sold a non-CAC, certified MS-65 1923-D for $1,807 on April 29, and another without a CAC sticker for $1,744 on January 28, 2018. Sounds like a weasel is in the chicken house picking out the chickens he likes, that the fox had already picked out (for a price, of course). So, the farmer pays the fox for his opinion on his chickens, then the farmer pays the weasel to endorse the chickens that the fox picked out, to say they are what the fox said they were. In the end the farmer still has the same chickens, only now they have more bands on their legs. The turkeys seem to be flocking to this event.